Photo courtesy of Marshall Chamber of Commerce. Visit the beautiful garden that commemorates Marshall’s famous canine legend. 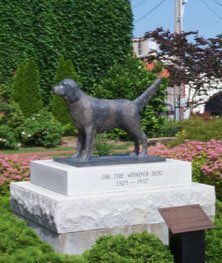 Informative storyboards tell Jim the Wonder Dog’s story while you stroll this peaceful botanical park and water garden accented by a brick wall and bronze statue of Jim.